The machine is suitable to string one or two ropes or bundled conductors on bull-wheels with two pair of bull-wheels with completely independent controls. The bull-wheel grooves are made of wear-proof interchangeable nylon sectors. The machine is completely electronically controlled. 2 closed hydraulic circuit for step less speed variation in both rotating directions. 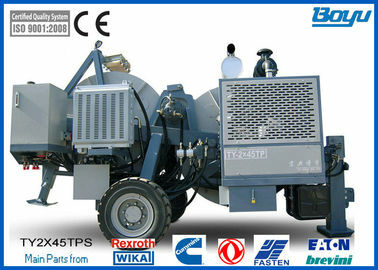 This machine is provided with 2 pull pro-setting system that maintains the pre-set pulling value (also when the speed is reduced to "0") by automatically adjusting the operation speed according to the friction and unexpected loads which may occur. Jiangsu Province Yixing Boyu Electric Power Machinery Company is located in west side of the beautiful and fertile Taihu Lake. We are near Shanghai City.